Mari Jungstedt's third Gotland novel follows the same theme as her earlier novels UNSEEN and UNSPOKEN. UNKNOWN at first concerns two crimes: one in which a horse is savagely killed; and another in which a young student, Martina, is murdered. The girl has been working on an archaeological dig over the summer, part of a team excavating Viking silver and gold coins and ornaments. She's attractive, and there are a number of men who showed an interest in her, possibly including one who might want a liaison kept secret. Inspector Anders Knutas of the Gotland police is once again in charge of these investigations. He's frustrated with the lack of progress made by his team, and the apparent lack of connection between these crimes and later ones, as he is convinced the perpetrator is the same. Emma and Johan also continue their story. Emma has decided to divorce Olle and to have the baby she and her lover, TV journalist Johan, accidentally conceived in the last book. She feels unable to commit to Johan after the baby is born, in the face of Olle's jealous rages and her sense of duty to their two young children. Johan, in the meantime, is investigating the crimes himself, trying to discover what the police know but don't want to release to the media, in a bid to make a success of his temporary placement on Gotland so that he can stay with Emma, if she will have him. Although the elements of UNKNOWN are put together in a professional manner, I found it rather formulaic compared with the previous two volumes in the series. The sections about the Viking history on the island certainly come to life, but the story of the investigations is flat, without much spark. The inclusion of interleaving chapters told from the point of view of the mysterious perpetrator is too much of a cliche, as are the supposed psychological insights provided by the profiler. The solution to the murder is fairly weak, and the ritualistic elements seem tacked-on and hence unintentionally amusing. The author has a knack for conveying the apparently trivial yet all-important domestic problems of her characters, as well as a touching sympathy with the victims of the crimes she describes. However, the police procedural aspects of UNKNOWN could do with more originality and verve. These books have the potential to be as good as Henning Mankell's Wallander series, if the author can break out of the formula and follow some new leads, providing more insights into her police characters in the process, as well as continuing with her strengths: TV media politics and the family upheavals of Emma and Johan. 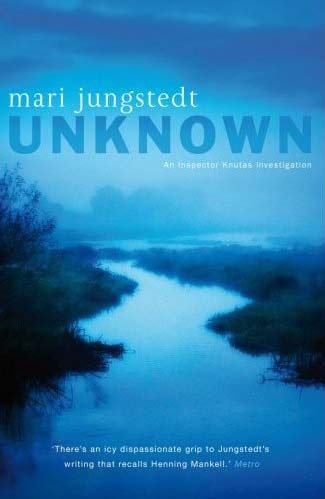 Read another review of UNKNOWN.